This tool match a MAC address to its manufacturer or match a manufacturer to the MAC addresses it uses. Max 4000 MAC addresses can be checked at any one time. The database currently contains 18518 records, last updated October 12, 2013. 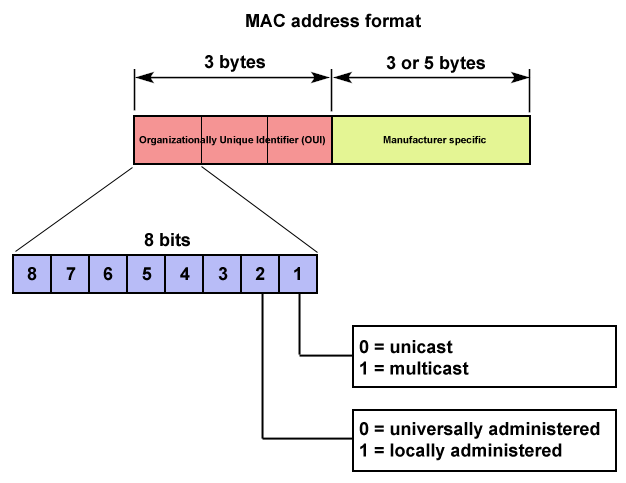 Universal administered MAC addresses assigned to devices by their manufacturers (burned-in). Not all manufacturers make their OUI public and the OUI may not be the actual manufacturer because of subcontracting. Local administered MAC addresses assigned to devices by network administrators, overriding the burned-in (stored) addresses. Local administered addresses do not contain Organizationally Unique Identifiers (OUI). The first three bytes identifies the manufacturer also known as the Organizationally Unique Identifier (OUI). The following three (MAC-48 and EUI-48) or five bytes (EUI-64) are assigned by the manufacturer. The 2nd bit of the first byte is referred to as the U/L bit, short for Universal/Local, which identifies how the address is administered. The first byte in binary form is 00000100, where the second bit is 0. This is a universally administered address. The first byte in binary form is 00000011, where the second bit is 1. This is a locally administered address. Enter one or more MAC addresses (Max 4000) in the textbox, each on a separate line and select radio button: "Enter MAC address". Create a text file where each MAC address must be on a separate line and upload this file. Enter a single manufacturer name in the textbox and select radio button: "Manufacturer name". If the number of MAC addresses entered is less than 1000, the found manufacturer name and its corresponding address is displayed. If more MAC addresses is entered than only the manufacturer name is shown. The found Organizationally Unique Identifiers (OUI), manufacturer names and addreses can be found in the ouput area. The output uses the "|" delimiter as a value separator.